Pattadakal: Pattadakal or Pattadakalu is another important historical place in Northern Karnataka along with Badami and Aihole. Pattadakal is famous for the magnificent temples built during Chalukyan period in 6th and 7th century. The place is located on the banks of Malaprabha River in Bagalkote district. Being one of the UNSECO’s world heritage site the temple architecture reflects the rich history of the state. These wonderful monuments clearly express the art, architecture, administration, literature during Chalukyan period. There are both rock cut monuments and structural monuments. Pattadakal is also famous for the dance festival which is held in the month of January every year. It is organised by government of Karnataka to showcase the beauty of the temples in Pattadakal. 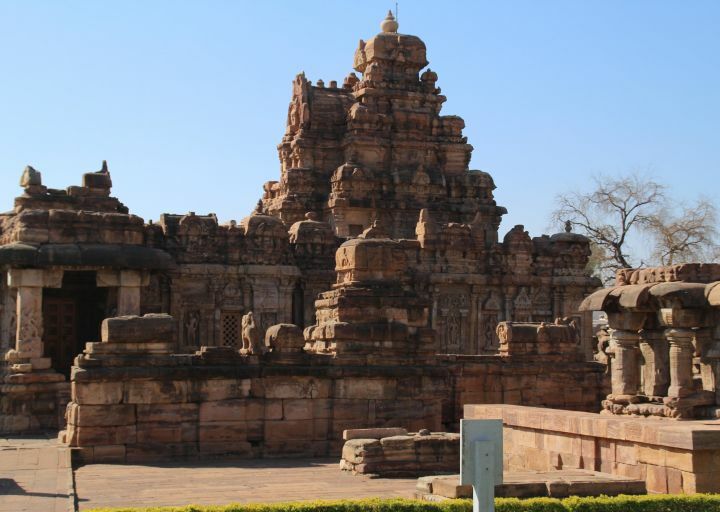 History of Pattadakal: Being on the banks of the River Malaprabha, Pattadakal was considered as a holy place hence the place was also called as place of coronation. It was also known as valley of red soil or city of red. Chalukya ruled Pattadakal for a very long period until in 10th century when the region was taken over by Rashrakutas. During 11th and 12th century the region came under Chalukyas of Kalyani and Western Chalukya Empire. After the fall of Chalukya of Badami, Pattadakal saw lot of changes in the ruling and it was also destroyed by the Delhi Sultanate during 13th century. Some of the other rulers who ruled Pattadakal are Vijayanagara Empire, Adil Shahi dynasty, Mughals and the Tipu Sultans. The monuments are built both in northern and southern India style. There are in total 10 temples in Pattadakal out of which 9 are Hindu temple and one is Jain. 8 temples are located in the same area only one Hindu temple is little far away from these temples. The Jain temple is little far from the 8 cluster of temples. All the Hindu temples are dedicated to Lord Shiva; however one can also see Vaishnavism and Shaktism theory also being featured. The temples also showcase the stories of Ramayana, Mahabharata, Bhagavad gita and Panchatantra. The Jain temple is dedicated to only one thirtankara. The pillars and walls of the temples are beautifully decorated with intricate carvings. All the Hindu temples are the banks of River Malaprabha. Among 10 Hindu temples four temples are built in Nagara style of Northern India, four are built in Chalukya Dravida style only Papanatha temple is a fusion of both Northern and Dravida style. The last temple that was built was the Jain temple which was probably built during Rashrakutas. 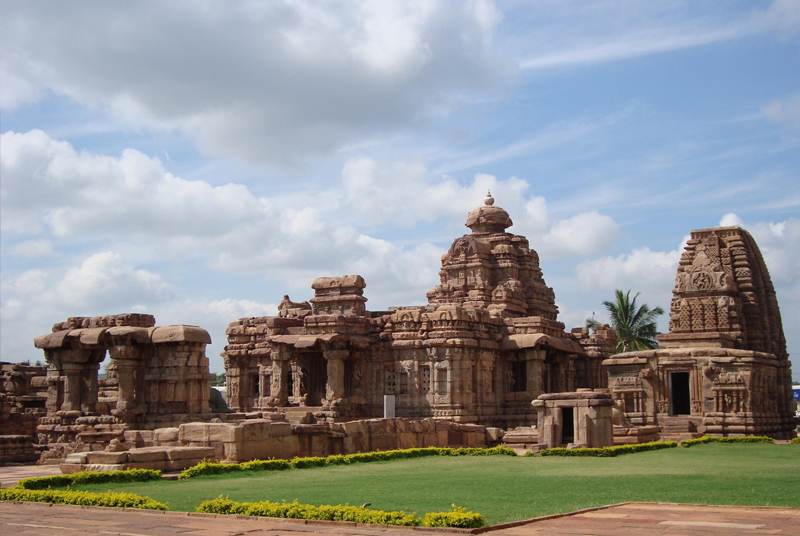 The largest and the most famous temple of Pattadakal is Virupaksha temple. 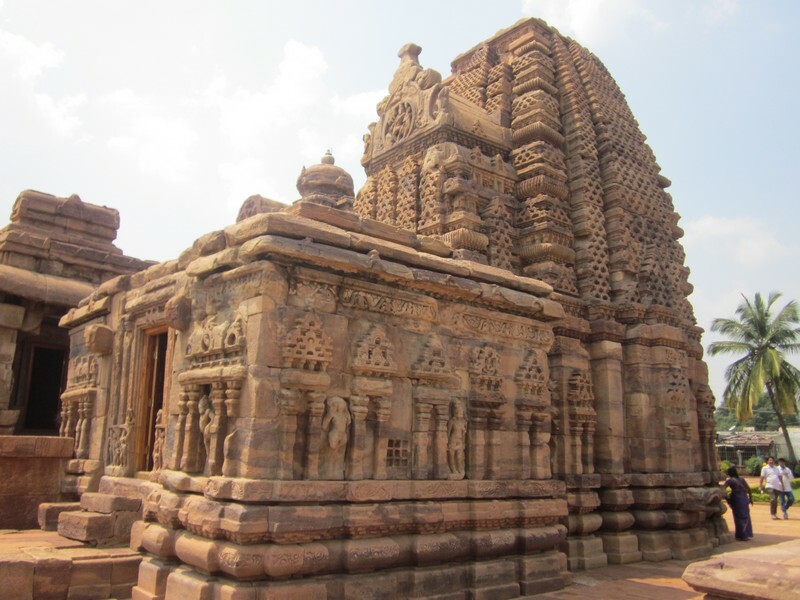 Virupaksha temple: One of the most famous and important temple in Pattadakal is Virupaksha temple. The temple was built in 740 AD by Queen Lokamahadevi to commemorate the victory of her husband Vikramaditya II over Pallavas. Facing towards the east the temple was built in Dravidian style of architecture. The garbha griha has Shiva linga and also has pradhakishna patha. The temple has beautiful intricate carvings of Gods like Narasimha, Bhairava, Nataraja, brahma, Durga, Saraswati, Lakshmi and many more. The temple also has friezes( a horizontal sculpted or painted on the walls or ceilings) all around depicting stories from Ramayana, Mahabharata, Panchatantra and some Hindu texts. Above the sanctum there are three storied pyramidal structure which has motifs that resembles the shrine below the pyramidal structure. The walls of the sanctum are beautifully decorated with carvings of Shavism, Vaishnavism and Shaktism. Some of the carvings depict few stories from Ramayana like that of Goddess Sita being abducted by Ravana and also the story of Golden Deer. The roof of the tower has parapet kutas which are decorated with Dravidian architecture called as kudus. The temple tower also has a Kalasha on the tip of the tower. In the inscriptions the temple is also referred as Shri Lokeshvara Mahasila Prasada. Mallikarjuna temple: Mallikarjuna temple was built around the same time when Virupaksha temple was built. This temple was built by Second wife of Vikramaditya Queen Trilokyamahadevi to celebrate the Chalukyan victory over Pallavas. Earlier the temple was also known as Trilokeshwara Maha Saila Prasada. It is located very close to Virupaksha temple and also resembles Virupaksha temple. The main difference between the two temples is roof of Mallikarjuna is hemispherical and while that of Virupaksha is square. Mallikarjuna temple has a garbha griha and pradhakishana patha. In the garbha griha Shiva linga is present and the temple is built in South India Vimana style architecture. The temple has beautiful intricate carvings and friezes all around. Kashi Vishwanatha temple: kashi Vishwanatha temple is a small temple built around 7th and 8th century by the Rashrakutas. The temple is built in North Indian Rekha Nagara style and the temple is on a raised platform with five layers of mouldings that are intricately decorated with carvings of animals like horses, elephants, lions etc. Even this temple is quiet similar to other temples. It has a grabha griha and a pradakshina patha with Shiva linga inside the garbha griha. The temple has intricate carvings of Lord Krishna, Ramayana and Bhagvad Purana. The ceilings in the mandapa have intricate carvings of Lord Shiva. Parvathi and Nandi holding Karthikeya. Galagantha temple: This temple was built in 7th or 8th century. The garbha griha has Shiva linga inside and a pradhakishana patha around garbha griha. The temple is built in rekha nagara style which has a hall inside garbha griha. Nandi is seated facing the garbha griha. There are various mandapas like Sabha mandapa, mukha mandapa. Towards the southern part is a slab which is carved showing eight armes Lord Shiva killing demon Andhaka and also wearing a garland of skulls as a scared thread called as janiwara in Kannada and Yajnopvith. The temple is mostly in ruins now except few places. Sangameshwara Temple: This temple was built by King Vijayadtiya in 743 AD. Hence the temple is also known as Vijayeshvara temple. Built in Dravidian style the temple has a garbha griha and pradakshina patha around garbha griha. The Garbha griha has Shiva linga. In front of the shrine is Nandi which is in the seated position. The temple is built on a raised platform with beautiful friezes of animals all around. Temples has intricate carvings of Shaivism, Vaishnavism and Shaktism all around the temple. Papanatha temple: This temple is little away from the eight monuments. The temple is built in 8th century with a unique blend of architecture of Dravida, Nagara and Hindu temple style. The temple has two interconnected mandapas with 16 pillars in one and another four pillars in another mandapa. The temple has a garbha griha which holds Shiva Linga but there is no seated Nandi in front of the shrine. The temple walls are beautifully decorated with the themes of Shaivism and Vaishnavism. The temple also has intricate carvings all along. Jain temple: This is the only Jain temple in Pattadakal which was built in 9th century by Rashrakutas. The temple was built by Rashtrakuta King Krishna II. The temple holds the statue of Jina. Like any other Hindu temple even this temple has a pradakshina patha, mandapa and porch. The temple has intricate carvings all around and at the entrance of the temple one can see huge beautiful carvings of elephant. 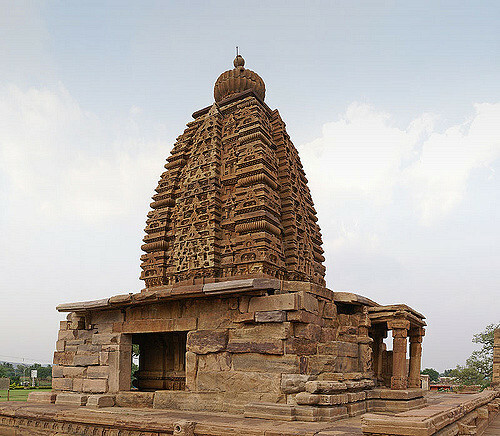 Pattadakal is easily accessible by road and rail. The nearest airport is Belgaum airport which is around 4hrs drive. By rail Badami is the nearest railway station which is 22kms from Pattadakal which is around 40mins drive. Pattadakal is well connected through road. Several government and private buses run from all the major cities of the state. Badami, Aihole and Pattadkal are world famous tourist place which are closely located. Distance between Badami and Aihole is 35Km and distance between Aihole to Pattadkal is 14Km which is around 20mins drive.